Problems with this form? Or questions? Email us at jesterartspace@gmail.com. If you prefer, you can download a mail-in form. 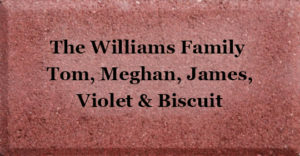 With every donation of $100 or more, donors will receive a commemorative brick with their custom message to be placed on the Jester Farmhouse property when renovations progress*. You can order more than one! Would you like to give a brick as a gift? We can also mail you a card to give the recipient, letting them know what their brick will say! *Jester Artspace reserves the right to reject messages it deems inappropriate for community standards, with full refund. Bricks will be purchased when construction begins. Donations are refundable until that time.